Tishani Doshi is a poet, writer and dancer living between two fishing villages in Tamil Nadu, India. In addition to pursuing her own literary career publishing six books of poetry and fiction, she toured in the work of Chandralekha, an Indian choreographer who fused Bharatanatyam with yoga and martial arts. Tishani shares how dance and literature have intersected and influenced each other in her career. Can you tell me a little about your dance history? I began dancing when I was three with a Bengali teacher, Mrs. Sen, who had fabulously eclectic taste. I was taught a little bit of Bharatanatyam, Kathak, Odissi, Manipuri and folk. 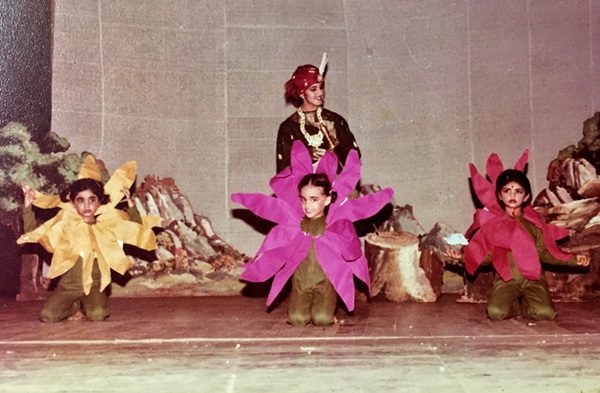 Every year, there was an annual dance drama and I was featured as flower, prince, peacock, etc. I abandoned dance at 14 thinking I would be the next Gabriela Sabatini, but it turned out my enthusiasm for tennis didn’t translate into championship material. My return to dance happened at 26. I’d been living away from India for some years, and I came back home to Madras with the idea of being a poet. I was in a state of openness and confusion. That’s when I met Chandralekha. She seemed to understand that what I was seeking was my life, that it was out there somewhere, I just had to find it and inhabit it. I was taking kalaripayattu lessons (a martial art from Kerala) with one of her longtime dancers, Shaji John. He saw I had a certain flexibility. They had been looking for a new female dancer. Cut to me in Chandra’s famous living room of swings doing backbends. She said: Would you like to come work with me? I said, yes. There began my real dance history. Since the passing of Chandralekha, what has your dance practice looked like? It’s strange, I spent 15 years performing just one piece – Sharira – which was Chandralekha’s final choreography. It’s an intimate, slow, meditative work with just two dancers, and for the first five years, while Chandra was alive, the piece evolved and changed a great deal. When she passed away, we decided we’d continue to perform it if we were invited to. For the next 10 years, invitations kept coming, and the audience response was immense. The challenge then was how to resist the mechanical, how to infuse the piece with new power. So many of my concerns changed and shifted while performing Sharira. I had become emotionally stronger, but I’d lost some limberness in the lower back. I had become possessive about those movements that I’d been rehearsing for so many years. They were mine. Towards the end, something powerful happened. I began to transcend a sense of gender while dancing. This choreography was very much about male and female energies – purusha-prakriti, shiva-shakti – but somehow it was taking me to an ancient place, a time that was pre-gender. I felt like an amoeba, like one of those creatures coming out of the sea to the land for the very first time. I began to feel free from anatomy, and that was the first time I’ve ever felt that. It was liberating and incredibly empowering. We stopped performing the piece two years ago, and I feel a huge sense of heartbreak about not taking it out into the world anymore. But I’ve been experimenting with some ideas of my own and have made a short choreography in response to the title poem of my new collection – Girls Are Coming out of the Woods. I continue very much in the tradition of what I learned from Chandra — employing martial stances, yoni mudras, pared down facial emotion, and a great sense of stillness and rootedness. How has your literary practice informed your dance practice? lt’s hard to describe, but there’s a shared vulnerability between poetry and dance, in putting yourself out there in the dark. Chandra always introduced me as a poet, a non-dancer; she delighted in the idea of this invention – her invention. She was a poet herself, haikus were her thing, but she also loved to recite Shelley and Kalidasa and she was the one who introduced me to the translations of AK Ramanujan, Speaking of Siva and Hymns for the Drowning, which became pivotal books for me. So there was always this sense that even though the dance work we were doing was abstract and devoid of words and narrative, its essence was poetry. The distillation that poets do, the many layers a poem goes through, all this was crucial to understanding embodiment in dance. Poetry was a way to facilitate those transformations. Vice versa, how has your dance practice informed your literary practice? This is a much easier process to describe. It’s the physicality, the discipline, the show-up-to-work-whether-or-not-you-like-it aspect of dance that I badly needed as a writer and that dance taught me. Also, understanding time, how it is held in the body. Rhythm. Slowness. For many years we rehearsed in silence, with no live or recorded music, and it was a huge practice in understanding how you could hold time in the body. How you could manipulate time. Poets need that. Are there certain themes or issues you feel particularly compelled to address in your work? I have some obsessions, yes. I’ve looked at violence against women for a long time and tried to address it in my work. I am interested in ideas of reclamation and how art may be the vehicle for this. I stay awake some nights worrying about the towers of plastic crap I’ve generated and everyone else’s and wonder what will happen to all those towers, and climate change and the destruction of the environment. I think a lot about how humans are so breathtakingly cruel but at the same time capable of beauty and honor. I’m interested in how we can make temples of solitude amidst the clanging of the world. These are some of the things I think about. What are you currently working/focused on? I’m finishing edits on a novel which will be published in April 2019 with Bloomsbury called Small Days and Nights. I’m just starting to get ideas of how I can create a companion performance piece, which will involve text, movement and theater. I’m collaborating with a genius musician, Luca Nardon, who worked on my previous experiment as well. This one is a longer piece with a coastal feel – it’s influenced by the waves, the fragility of that ecosystem, the detritus that washes up, the hope that the horizon can bring. Let’s see how it goes. To learn more, visit tishanidoshi.weebly.com. 3 in 1 ..it’s rare to find a talent like u..my good wishes & regards..
Great work Tishani you combine my favourite arts with Indian condiments and humanity.